Notes: slave trade fort from Copper plate engraving,by Jakobus van der Schley after a sketch by William Smith, hand coloured, from the Dutch edition of ?Histoire G?eral des Voyages? This was a monumental eighteenth century general history by Antoine Fran?is Pr?ost d?Exiles, a French author, novelist, theologian, natural historian, and a priest of the Jesuit and Benedictine oAfrica Ghana, Fort Tantumquery (Tantumquerri) Bellin 1754 Titled: Vue Sud du Fort de Tantumquerri. Description: Africa Forts and Castles at (Moree) Cape Coast Ghana. 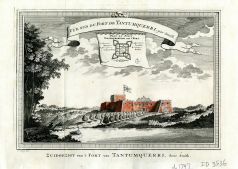 18th Century print of Fort Tantumquery at Otuam in the Mfantsiman Municipal District Central Region of Ghana. The fort was built in1726 by the Royal African Company. In the 1680s the Company was transporting about 5,000 slaves a year across the Atlantic. Many were branded with the letters "DY", for its Governor, the Duke of York, who succeeded his brother on the throne in 1685, becoming King James II.rders. Published in 1747; see map 3532 for location of this fort.